I have never purchased with Overstock but will after this purchase! 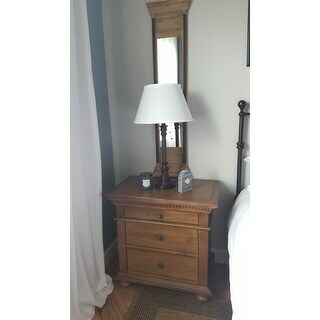 This nightstand matches my Restoration Hardwardware dresser at a fraction of the cost - so pleased! I was searching for a set to complete a guest suite, and couldn't find anything locally in my price range that I liked. I came across the Addington Hill set and it was exactly what I was looking for. There weren't many reviews when I purchased, so I was unsure of the overall quality. I purchased the 3-Drawer Night Stand to inspect and make my decision. The night stand arrived with some minor shipping damage (not the fault of the manufacturer) which I was able to repair myself. The piece was well made, and the overall quality was very good for the price. I went back to Overstock and ordered the 6 Drawer Lingerie Chest and the 3 Drawer Chest. Both of these arrived in perfect condition without so much as a dent in the box, as they were larger pieces they were shipped via a freight carrier - (the night stand had been shipped FedEx which would explain the abysmal handling provided.) The color in the pictures is an accurate representation of the wood tones. I would describe the finish as a rubbed-wax satin finish. It's actually done very well. There are some minor 'distressing' marks (scrapes and hole punches) but they are not obnoxious or overdone. Some of the pieces I looked at tried so hard to look vintage and worn that they only ended up looking fake and manufactured. 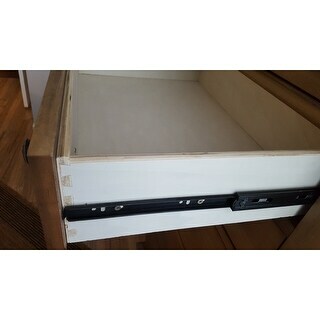 The drawer runners are full extension and operate quite smoothly. I would describe the drawer pulls as a vintage iron with some verdigris patina on them. The drawer boxes themselves are dovetailed plywood, however, the plywood is definitely unfinished. There is no clear-coating on them that I can see, and I would definitely recommend using a drawer liner or sealing the plywood with some poly if you plan on storing delicates. They are extremely smooth, but I'm not sure if any of the wood grains would cause a snag. Overall I am extremely happy with my purchase, the overall quality and finish asn well as the price. Everyone who sees them comments on them. I would have given these 5-stars but I knocked one off for the unfinished plywood (which could be easily remedied in my opinion). Very heavy and great quality. Very easy assembly. Looks like high end furniture store piece. We bought two to match the dresser. They are huge so make sure they can fit in your space! They are sturdy, nice finish and look great in our guest room. What a find!!! If this is a look your wanting, the quality is there. Take note of the size/ height. The "aging" look /process isn't my top preference (scratches); however, the overall look, size, quality, and cost is a perfect. Very attractive nightstand. Well built and just the right size. Lots of storage space. Could have an interior plug for phones Etc and would be even better. 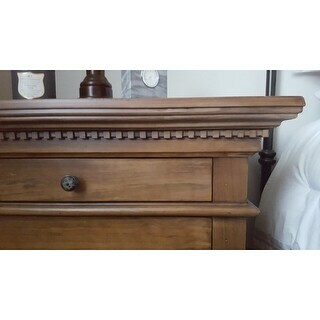 Matches our Restoration Hardware bed frame perfectly, at a fraction of the cost. "The final picture of the nightstand shows dimensions and it appears to show the nightstand is 32 front to back and 20 side to side. This contradicts your answer of Mar 9. Which is it?" Front to back this measures 20 inches and side to side it's 31.38 inches. The diagram is incorrect. "I am confused by the wording. When you say 32" long..do you mean side to side (knobs in front, across the the top) and when you say 20 inches wide..is that what could be called the depth (front to back)??" This measures approximately 32 inches side to side, 20 inches from front to back and 30 inches from top to bottom. "Please give me all dimensions of this nightstand, height, depth and width. Thank you!" 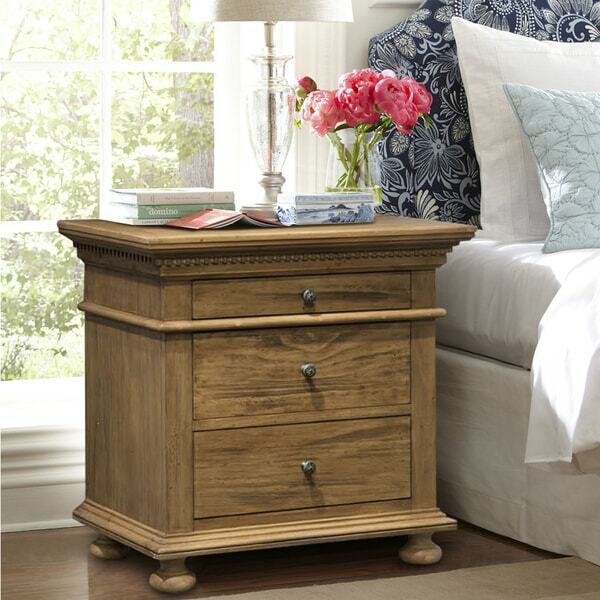 This night stand is approximately 30 inches high x 20 inches wide x 32 inches long.
" What is the height "
The dimensions are approximately 30 inches high x 20 inches wide x 32 inches long. when you say "long" do you mean the width? or do you mean depth when you say "long"